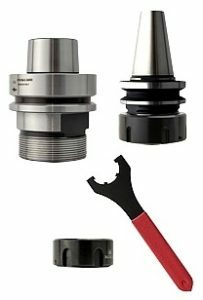 The ever-increasing range of CNC parts and accessories stocked by Wealden now includes not only collets in ER and OZ series, but also tool holders, collet nuts, pull studs, wrenches and tool holder assembly devices. All collet nuts are balanced and available either standard or ball bearings types. The pull studs are available in five different types to suit different CNC machines. Wrenches are available in standard and torque versions and two heavy-duty assembly devices suit either ISO30 or HSK63 holders. The CNC accessories are available to buy on line from the Wealden website, as are the CNC collets.